Please note: A graphic image of the Abbie the black labrador is included at the bottom of this article. 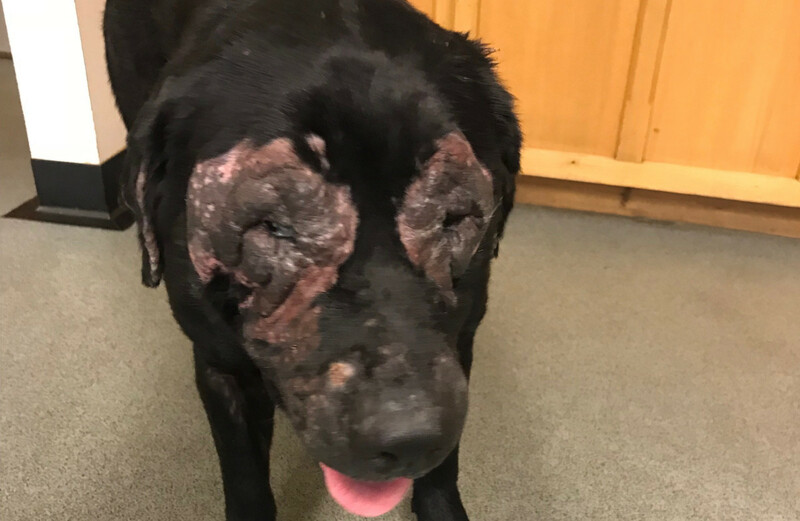 An Oswestry woman has appeared in court after her dog was left with a horrendous untreated skin condition which left her eyes badly irritated for months. An RSPCA inspector, who investigated the incident, said it was one of the most upsetting cases she has had to deal with because the black labrador, called Abbie, would have been in constant pain and barely able to see. Lisa Crossley pleaded guilty to an animal welfare offence of failing to seek veterinary care for her four-year-old dog when she appeared before Telford Magistrates’ Court on Friday 18 January. The court heard how the RSPCA was called to investigate the condition of the dog following a report by a concerned member of the public. The animal welfare charity rushed Abbie to a vet where she was found to have an untreated skin condition which had resulted in thickened, inflamed and infected skin around her face. It had thickened to the point of being grey and solid, known as elephantine skin. Abbie was left in that state between April 18 and July 1, 2018 while Crossley failed to get her the veterinary attention she needed. Sadly vets found her to be suffering to such an extent they felt the kindest option was to put her to sleep. Inspector Kate Parker, who investigated, said: “Poor Abbie had an awful skin condition which was left untreated and this caused her condition which meant her eyelashes were rubbing on her eyes constantly – which must have been horrendous. “Imagine how it feels when you have an eyelash in your eye – this dog had all hers in her eye and couldn’t relieve her own suffering for months – she would have endured constant pain and would have been unable to see. It must have been terrifying for her. Crossley was given a ban on keeping all animals for five years and will have to give up her two other dogs and seven cats within 10 days. She was also given a £298 fine and ordered to pay £380 costs.